Fight sequences in comics can be tricky to nail down. On the surface a fight sequence could been seen as a simplistic way for a comic to get through twenty pages. Good comics don’t make battles a means to an end, but rather they an extension to the story itself. Hal Jordan & The Green Lantern Corps #40 is a perfect example of this. 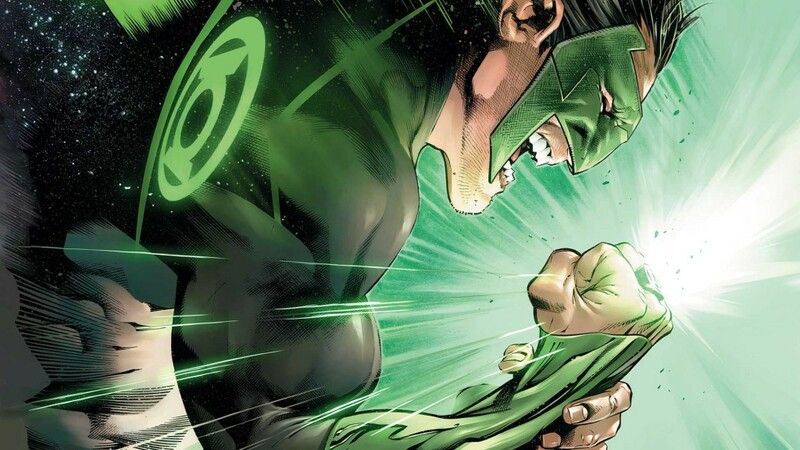 Each of the Lanterns personalities shine through even if they only get a panel or page to themselves, Zod’s motivations ring loud throughout the battle and you can feel the tension between the two factions. While there were splash pages galore, they served a purpose to the story and still looked amazing. Speaking of the art, Rafa Sandoval continues to be a beast. One aspect of fight scenes that many readers tend to overlook is the impact of hits. I know this seems trivial when storytelling and story progression takes top priority but you still want readers to be engrossed by the punches,lasers, and constructs flying about the page, even more so when you have Kryptonions involved in the conflict. Even though there instances of no SFX whenever Zod, Ursa or their son delivers a blow you can feel the impact. I have to suspend disbelief a bit because I know that a punch from either of these three should critically injured any Green Lantern, but I’m guessing it’s the ring’s aura giving them a little bit of a protection. I mean how else would you explain Guy taking multiple punches from Zod’s son and still manage to trash talk, well I guess you could say it’s because Guy is a stubborn mule. The point is that Sandoval continues his amazing work and we as Green Lantern fans should be grateful that DC hasn’t put him on Batman at this point. Even though Sandoval should be credited the most for this issue, I loved that Venditti twisted my expectations for this issue. I loved the fact that Zod’s family toyed with the Green Lanterns and once the tables turned it pretty much spelled doom for the Green Lanterns. Given the amount of buildup for this issue I thought that this was the final issue of the arc, so seeing Zod flip the script per say and almost decimate the Green Lanterns made me more engaged to see what will happen next. Yes I know that the good guys will win once the dust is cleared, but any great storyteller makes their audience forget about what will happen and focus on the matter at hand. This comic was fantastic, while I do believe the actual fight against Zod has been drawn out one issue to long, However that complaint is mitigated by the fight sequences within this issue, plus the tease of a second confrontation between Hal and Zod. Sandoval’s art remains some of the best art in superhero comics, Now if only I didn’t have to wait two weeks before I found out the conclusion of this story!